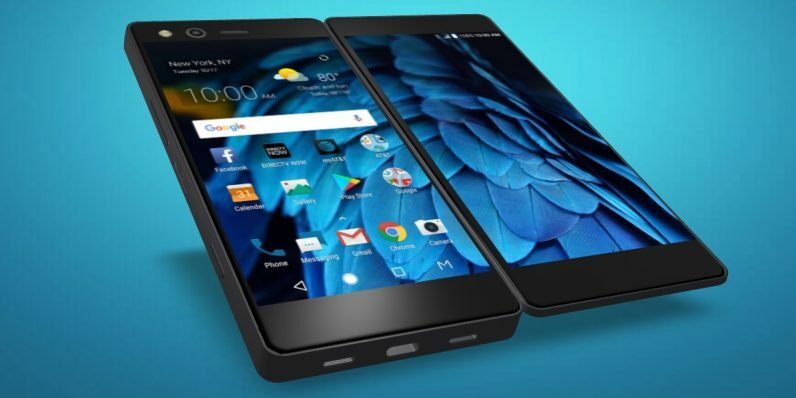 ZTE today revealed its latest smartphone, the Axon M. It has two screens and a central hinge allowing it to fold in half. The Axon M’s two screens fold together to make a single, double-sided smartphone, and can also be flipped open like a book. It’s internal hardware doesn’t seem that impressive — though it does come with the endangered headphone jack. But its foldable design makes up for any lack of interest the rest of it engenders. ZTE CEO Lixin Cheng described the M as part of a “new category of smartphone.” During the reveal event, the speakers put emphasis on how smartphones, for all their power and versatility, were hampered by size. The Axon M gets around this by being roughly the size of the average smart phone when folded in half. The phone features several modes for its two screens: Dual mode, which allows the two screens to operate independently; Extended mode, which turns it into a tablet dupe; Traditional mode, where it’s folded in half and behaves like a regular smart phone; and Mirror mode, which is just what it sounds like and seems to be primarily for making the phone a double viewing screen when it’s folded like a tent. This obviously isn’t the first time someone’s designed a foldable phone. Rumor had it that Samsung was working on a similar design before the Galaxy S8 was unveiled. It’s possible such a device is still in the works. The Axon M will be an AT&T exclusive in the US, and will be available later this year. Personally, I can’t wait to see how long it takes before someone cracks the screen by trying to snap the phone open and closed like a butterfly knife.